TravelVision: The Roxbury - Ooh La La! The Roxbury - Ooh La La! If you are looking for something or someplace different this trip, we've got just the place - The Roxbury, Catskill Lodging. Drive up to the Roxbury motel and at first glance you could be arriving at any typical place of lodging. The bright green door paint is a little imposing, but not outrageous and the setting is serene. And serenity here includes two spas. The place seems fairly mild mannered, almost nondescript, that is until the sun sets. At night the Roxbury goes neon! And that, my friend, is just the tip of the iceberg because at the Roxbury it's what's on the inside that's highly unusual! My favorite has got to be the "The Wizard's Emeralds" room. 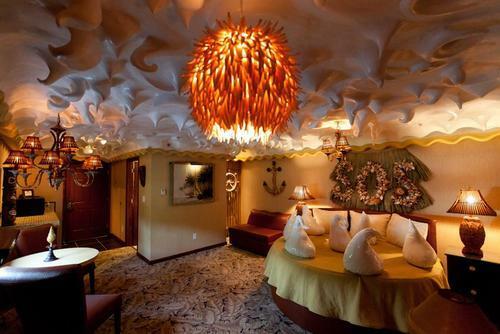 What you see here are a couple very unusual rooms, but trust me, the rest are just as colorful. The decor of each room is as outlandishly impressive as the next!